What exactly is indigenous cuisine, and how can it thrive in Edmonton? The entrepreneur from Sturgeon Lake Cree Nation is determined to bring his indigenous inspired-cuisine to Edmontonians. Forced to shutter his 124th Street restaurant, Bannock Burger, in 2014 following a rent increase he couldn’t afford, Thomas is trying again. “I didn’t know anyone else that was trying to do what I was, and I had to learn from a lot of my own mistakes,” Thomas says about Bannock Burger. He recently started a new catering company, Bannock Bistro, with offerings that revolve around the bread, including bannock tacos, bannock pizza and, of course, bannock burgers. Edmonton is ripe for the food, Thomas believes. After all, the capital city has the second largest indigenous population of any metro area in Canada, with 61,765 people, or 5.4 per cent of the population, trailing only Winnipeg. But while countless dishes from around the world are available in Edmonton restaurants, there’s a conspicuous lack of indigenous food. That doesn’t mean people aren’t trying. A year after Thomas closed Bannock Burger, Ian Gladue expanded his mobile concession, Native Delights, and opened a restaurant by the same name on 118th Avenue. But that restaurant closed 14 months later, after the lease came up and the building’s owner wanted the space back. As Gladue and Thomas can attest, challenges exist in bringing indigenous food to the mainstream. For starters, just defining indigenous fare can be difficult. “Each band and tribe has different ways of cooking, but what it all boils down to is sharing food and bringing families together and preserving our culture,” says Gladue, who is from Bigstone Cree Nation. 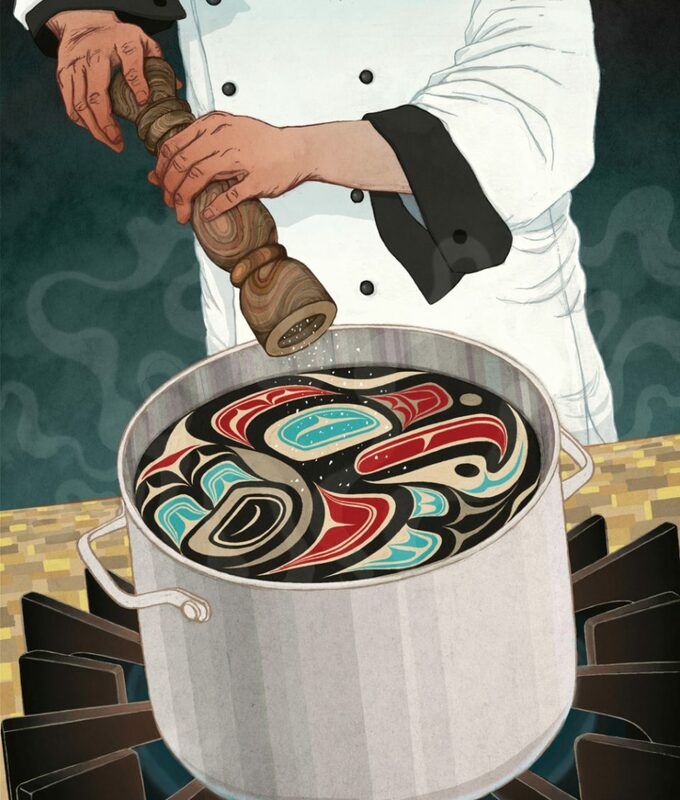 “It all depends,” says Thomas, when asked what indigenous cuisine is. Thomas grew up eating traditional foods, including wild meats and stews. The roots for his food businesses are in fond childhood memories, of eating bannock made by his kookum (grandmother). But for some indigenous people, bannock’s roots in colonization – it was brought to Canada by Scottish explorers and traders – has led them to abandon the food and shift to “decolonize” their diets. “We didn’t invent bannock. It was something we acquired and took in through our culture, but we also made it our own,” Thomas says. For him, opening Bannock Burger was about more than just introducing his favourite food to others. “I wanted to share with everybody that we’re capable of doing this, of owning a restaurant, of working, of doing something productive in society. I used Bannock Burger as a tool to do that,” he says. For Shane Chartrand, a chef from the Enoch Cree Nation, which borders Edmonton’s west side, indigenous food is about much more than particular dishes or ways of preparing food. To him, indigenous cuisine means being respectful and responsible at all stages: using local ingredients, knowing where your food comes from, using the whole animal, being thankful for what you have. “It’s enveloped in a belief system of food sustainability and food sovereignty, a natural state of mind,” he says. Chartrand, who was adopted by a Mtis family, enjoys travelling to other First Nations to learn their belief systems. “All indigenous people have different backgrounds and stories, and that’s the kind of thing I enjoy. I try to reflect that onto my plate, into my food,” he says. He’s currently working on a cookbook about “progressive indigenous cuisine,” to be released in the fall of 2018; food writer Jennifer Cockrall-King will be helping Chartrand write it. In addition to Sage, Edmonton diners can find an indigenous focus on the menu at Homefire Grill, a restaurant in west Edmonton established by the Alberta Indian Investment Corporation in 2005. Bruce Wells, a non-indigenous man originally from Newfoundland who formerly owned a Cajun restaurant, is executive chef. Wells says bison plays prominently on Homefire Grill’s menu, with the bison stew and bison meatloaf both popular dishes. Despite closing his first restaurant, Gladue hopes to reopen and eventually franchise Native Delights. “I hope to see it everywhere, like you see every other cuisine,” he says. He’s also focused on selling pnswn, a traditional dry meat made from thinly sliced buffalo.